Your music is your art. The realized expression of your creativity, emotion, and hard work. It’s what makes you stand out. It’s your product. It’s only natural that you want to protect it. Unfortunately, the truth of the matter is that you need to consider anything posted online for preview to be publicly accessible. It can be copied in one way or another and can’t be completely prevented. You can jump through increasingly complex hoops to try to secure it, but most methods are easily bypassed and provide little in the way of actual security. Those hoops just end up creating more work for you and a more frustrating experience for your fans. It also makes software that’s more difficult to support and maintain, which increases the cost. …we could throw some technical hurdles in their way, but if they hit one of those hurdles, it’s not like they’d slap their forehead and open their wallet. Instead, they’d just move on to some other site where those restrictions aren’t in place, and you’ll have squandered the chance to make your own site the premier destination for those seemingly cheap, but enthusiastic, word-spreading, and potentially later money-spending fans. In other words, the few people employing the above methods are better thought of as an opportunity, not a lost sale. It’s not all doom and gloom. Realistically, only a handful of visitors are looking to get something for nothing and they were most likely were never going to buy your music anyways. Instead of worrying about them, consider how you can turn random website visitors into fans. 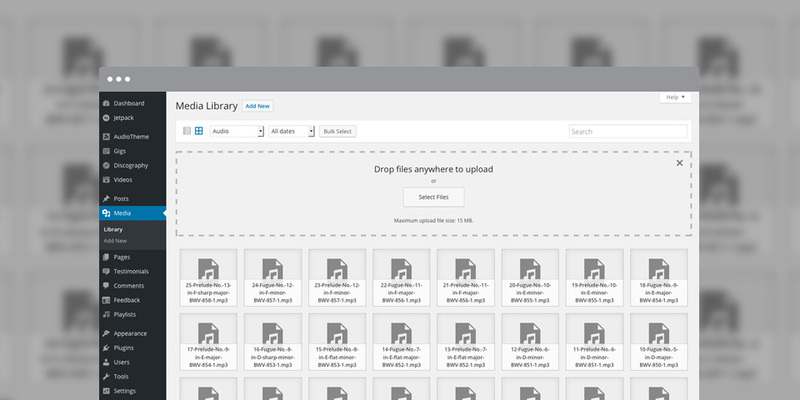 We recommend uploading 128kbs MP3 files for a number of reasons (you definitely don’t want to make your audio sound awful, so don’t go any lower than 128 for music). Keeping the bitrate low prevents the higher quality files from leaking, but also reduces the file size. Smaller files allow playback to begin faster — especially on mobile devices — and will reduce your bandwidth usage. If the thought of a handful of cheap fans downloading your music troubles your worried mind, you can upload truncated clips of your files like iTunes or Amazon. Just remember, you’re competing for attention, so you don’t want to turn away potential fans by creating a diminished experience. Oh, and one more thing: Disable directory browsing. Brady has over a decade of web development and WordPress experience. He co-published The 9513, a country music blog with nearly a quarter million monthly readers and recommended reading by the New York Times. AudioTheme is the culmination of his years of experience, passion for music, and unpleasant memories of MySpace.